Stormin 7's slot follows the script pretty much perfectly for what we've come to expect from most modern Ainsworth releases, so here we go again: same basic snick-and-crunch reel sounds, same stacked Wilds on last 3 reels and same type of bonus game. Fair enough the symbols and theme are slightly different although if you see their Thunder Cash game even that may be considered kind as we have similar casino-related icons again. Can we forgive this mediocre start if these 7's have our bankroll stormin up? 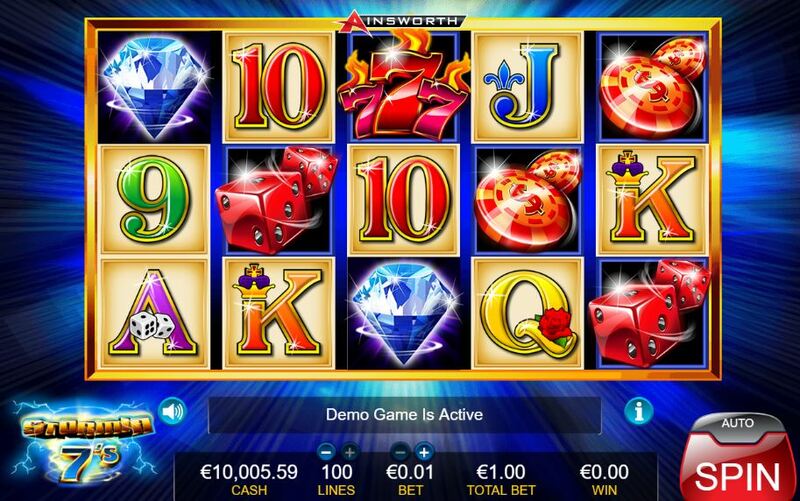 Ainsworth seem to like the 100-line format over a 5x3 grid and that's what we get here as with the Cash Cave and Crystal slots. The Golden $ is a stacked Wild on reels 3, 4 and 5 (did I mention that before?) and the remaining icons are single, including the Diamond scatters on all 5 reels which offer the only significant pay at 100x bet for all 5. The 7's pay 7.5x for a full line, followed by Banknotes or Dice at 1.5x, Chips at 1.25x and the six card values all pay 1x. Naturally these are low due to the 100 pay lines but even so you'll struggle to see more than 2 or 3 of the 5-of-a-kind wins in the same spin, which means the stacked Wilds take on a new importance. 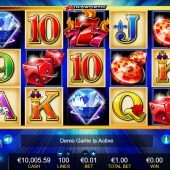 Having landed 3 or more Diamond scatters you will be awarded 10 free spins. This is where a hitherto disappointing game redeems itself as we see stacked blue Stormin 7's added to the centre 3 reels. You need to see any part of two or 3 stacks in view to trigger a re-spin. Only the reels with the Stormin 7's will re-spin, the others hold. On the second reel, during the re-spin, Stormin 7's will be a full reel of alternating stacks of 3 rows of single and x2 7's. On reel 4 you'll get the same but with x3 7's. If reels 2 and 4 are involved your multiplier becomes x6. The Golden $ wilds still appear on the last 3 reels as well. So the ultimate re-spin would be: landing top icon(s) on reel 1 and Golden $ Wilds on reel 5 and all 3 centre reels with a Stormin 7 in view. All 3 centre reels re-spin and you get fully-stacked x2 on reel 3 (reel 3 would be a normal 1x Stormin 7 Wild reel) and fully-stacked x3 on reel 4. You would then have the last 4 reels effectively as a 6x block Wild thus guaranteeing 100 5-of-a-kinds at 6x. Unfortunately Ainsworth have pulled their usual stunt to prevent huge wins here by reducing the 7.5x for the top red 7's icon to 3x in the bonus game. This means if you hit the example here you'd be pushed to see much more than 500x bet. An interesting bonus but don't expect more than 2 spins to have the 2 Stormin 7's appear. If you retrigger the round an extra 5 spins is added.